How Do Some of These Affect Your Smile? WHEN IT'S WARM OUTSIDE we all enjoy our favorite warm weather foods and beverages! Have you ever considered how some of these affect your smile? You may be surprised. Here"s a short list of foods that can do some damage to your teeth if you're not thoughtful about it. Iced Coffee Many people not only start the day drinking iced coffee, but continue to sip on it throughout the day. 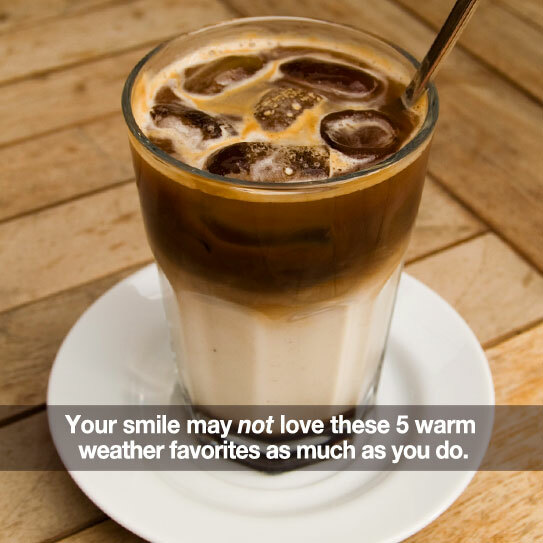 Because your teeth are very porous, coffee can leave significant stains on your teeth. Lightening up your coffee with cream or milk helps a little. These drinks may seem harmless because they don"t have sugar, but they still have a lot of acidity and other harmful substances that can affect your tooth enamel. Don't swish around sport or fruit drinks, or hold them in your mouth. After drinking sports drinks, wait an hour before brushing your teeth so you don't harm the softened enamel. Visit your hygienist to be sure you are not letting decay get the best of your teeth. Enjoy the warm weather! And, if you have questions about this information, please let us know and visit us at our Manalapan, NJ office.